She is a Rat Terrier. Where did you get Toki? 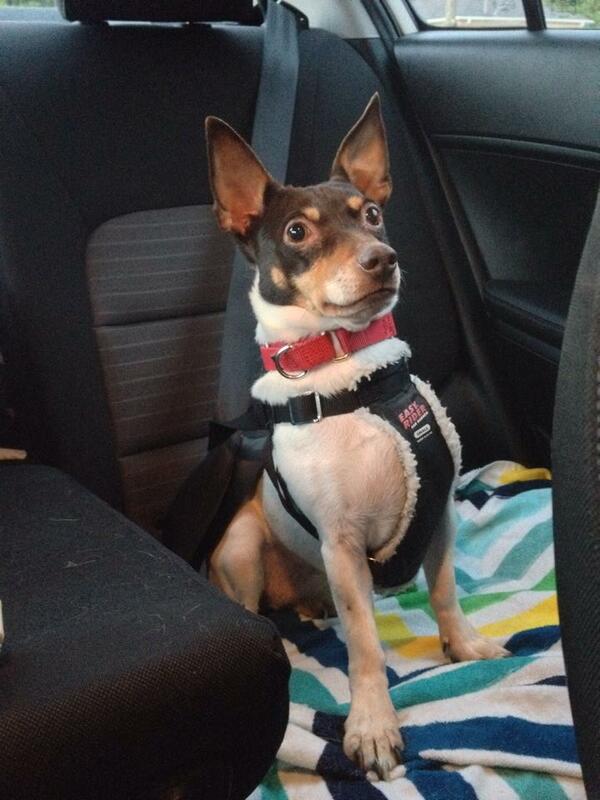 Toki was adopted from Just N Time Rescue in Barrie,ON and was a rescue from a hoarding situation in Ohio. It is hard to believe how far she has come since then and I thank Just N Time for her everyday. An estimate of her age is between 4-6 years old and an exact age is not known because she was a rescue. Is Toki a certified Service Dog? Toki is not a ‘certified’ Service Dog but that does not mean she is not a Service Dog. She is not from an organization but has been trained by myself with the help of trainers, to my specific needs. Service Dogs do not need to have certification to work in Ontario,Canada but proper paperwork is needed from a treating physician. What makes Toki a Service Dog and not a pet? Toki is trained to help me with any issues related to my medical condition. She is trained on queues and body language to assist me when necessary. She is brought into stores with me because she is needed for me to function daily. Toki is not just a dog out for a walk and fun time, she is a trained working dog. What Does Toki do for you? I do not feel comfortable going into specifics but Toki helps me with my daily life. She helps me when I need assistance with my condition. Toki is a PTSD service dog and that is all I really feel comfortable with people knowing. What exactly she does for me is really personal and when I am asked, I find it very rude because it really isn’t anyone’s business but my own. What does PTSD stand for? Does Toki know any tricks? I have not trained Toki to perform any tricks because I feel it is not relevant to what she is needed for in my life. Don’t get me wrong though, she can make a whole bowl of food disappear! Does Toki go everywhere with you? Toki goes everywhere with me including stores and restaurants. The only time Toki does not go with me somewhere is if it is not good for her health/safety. She stays home with my Mom during these times. This would be places like the zoo due to the possibility of her catching something from the animals or the beach because there is a risk she can get heatstroke. I always put her health and safety into account before I take her anywhere with me. No, please do not pet or distract my dog as she is working and needs to focus on myself. If Toki is not working, than she can be pet but please always ask first. Toki is a working dog who helps me with my everyday life and when I am on vacation she is with me. Toki does not work every second of her life and she does take some down time when off duty at home or when I am with family. I am always asked if Toki is happy with working and if she gets tired of working all the time. I am pretty sure it is hard work and she does get tired but she does not work all day-everyday. When she is home she is just like any other dog and enjoys treats and fun in the backyard. Her favourite past-time is to chase her 4 cat-siblings around the house. She knows when the leash and vest are on that it is time to work and help me out with my day. This past weekend was my first time away at a cottage with Toki. We were invited by friends and I was super nervous at first about having Toki with me. She has never been on any sort of vacation with myself and I was not sure what to expect. I decided that Toki would be off duty and enjoy herself while at the cottage with friends and another dog. Off-Duty meaning she was able to be off leash and play but she was still there if I needed her. She had never been on a boat before and we had to take one over to the island the cottage was on. She seemed to enjoy the boat ride and even provided me with some comfort because I was really nervous. When we got there we were greeted by a big dog named Bruce who Toki seemed to really get a long with. I was afraid that a big dog would just see her as a toy to chew on but he was very well behaved with her. I think it was love at first sight because those two were so good all weekend together. The next day we all strapped some life jackets on and went canoeing and Toki joined in on the adventure. She was a little hesitant at first but eventually made her way into the canoe and settled down. We canoed for about half an hour before making it back to shore where we decided to swim on the other side of the island. This was where Toki had her first swim with me and she did not like it at all; or so we thought. Later on in the vacation Toki actually came into the water on her own and swam to me. It was super cute to see her enjoying herself and it made me happy knowing I had her there with me. She also liked running around the island with Bruce and playing with him. They would chase each other from one end of the island to the other. Toki was a dirty mess from all the water and dirt so once we were back home it was definitely bath time. I was very happy to be able to bring my Service Dog with me and have her go on a mini vacation herself. Now that we are home it is back to work for her with helping me out in public. Who knows, maybe another vacation will be in-store for us. Some Service Dogs do not have to work 24/7, it depends on their handler and their needs. Is Toki an Actual Service Dog? This is a question I get a lot with Toki and usually I reply with “Yes, she is.” It seems the public believes that only dogs coming from organizations are “actual” Service Dogs. I am here to put that myth to rest and let everyone know that any dog can be a trained Service Dog no matter what the size or breed. All breeds can be trained to be a Service Dog if the dog fits the right demeanour. Just because a certain breed has a bad reputation does not deem them unfit to work or define their ability to perform in public. Toki looks a lot like a Jack Russell so people automatically assume she is a hyper mess. 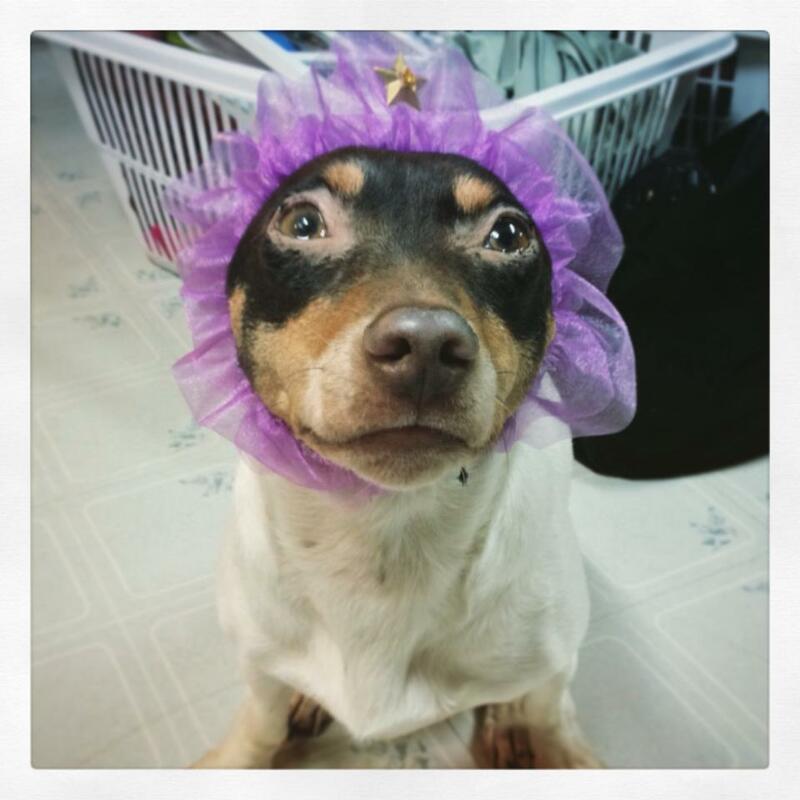 Well not all Jack Russells are crazy when trained properly and Toki is not even a Jack Russell; she is a Rat Terrier. She is a dream to train as Rattie’s are very trainable and she also has a very docile personality which was perfect for myself as her handler and trainer. She has been trained in obedience and the services she provides me with. Small dogs are usually used for tasks that do not assist with mobility or standing. This is because they are low to the ground and require the handler’s ability to crouch down to them. Toki is not used to assist me with my mobility so being small is not an issue for myself. She can still jump up if she is needed and I can get close to her when I need to. On numerous occasions I have been asked if Toki is a “real Service Dog” and i have always been so confused as to what a “real Service Dog” was. Toki is a “Service Dog” so I am unsure what people are defining as “real”. I would never ask anyone with a medical device if it was real and it is actually quite rude to ask. It does get very annoying to have to explain to people she is a trained Service Dog and that Service Dogs do not have to come from a special organization. Toki is used to assist me and what she does for myself is really no one’s business. She is used to help me with my daily living and that is all you need to assume when you see us. Please know that any dog big or small and any breed can be used as a Service Dog and what they do for their handler is very personal and not really anyone’s business but their own. As people we should not be asking about medical history or diagnosis’ when we see someone with a medical device; which is what a Service Dog is. Just know that when you see a Service Dog they are helping to make their handler’s daily life a much better experience. Any dog can be a Service Dog no matter the breed or size. 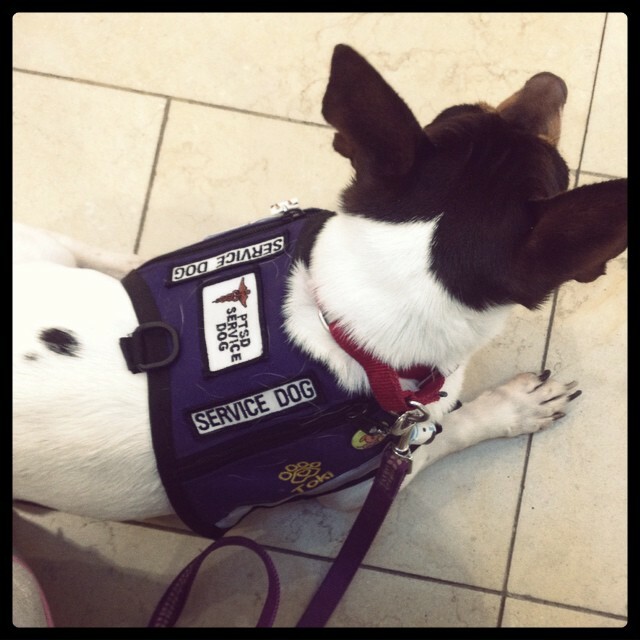 A Service Vest is crucial to any Service Dog as it allows the public to understand that the dog is on duty and working. For Toki, her vest also indicates work-time much like a uniform to us. She knows when her vest is on that it is time to go out and assist me with my day. 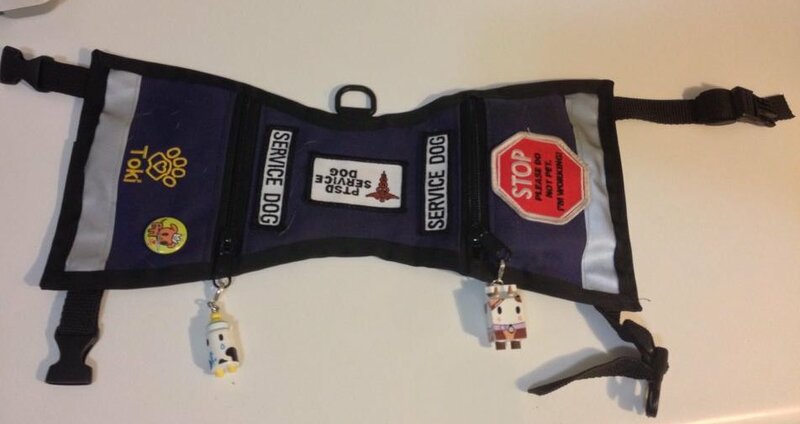 Service vests come in many styles, colours and fabrics and it really is up to the handler to find one that is most suited for their service dog. I have noticed that a better quality vest is not questioned as much when in public as people seem to see them as “authentic”, which really there are no official vests for all service dogs. Heavy duty and good quality vests seem to be the best option for many. Better quality vests can be quite pricey and this is why I initially had a blue hand-sewn vest for Toki. It was sewn by a friend and wasn’t the best quality and I was stopped a lot with Toki because her vest didn’t look “authentic“. This is why I mention the service vest in this post, because society doesn’t seem to know that any vest will do. They do not come from a company or organization specific to my dog and training (although vests for some Service Dogs can come from organizations, they do not HAVE to). I have since updated Toki’s vest and have had very little questions about her vest now. Toki’s current vest (pictured above) was made by The Raspberry Field and the quality is amazing. I chose the colour purple for her vest as it is the colour that represents my condition and it is one on my favourite colours too. Some people choose colours based on medical conditions and awareness but really it does not matter and does not necessarily define what the dog is used for. Really, the colour is up to the handler and what they prefer. 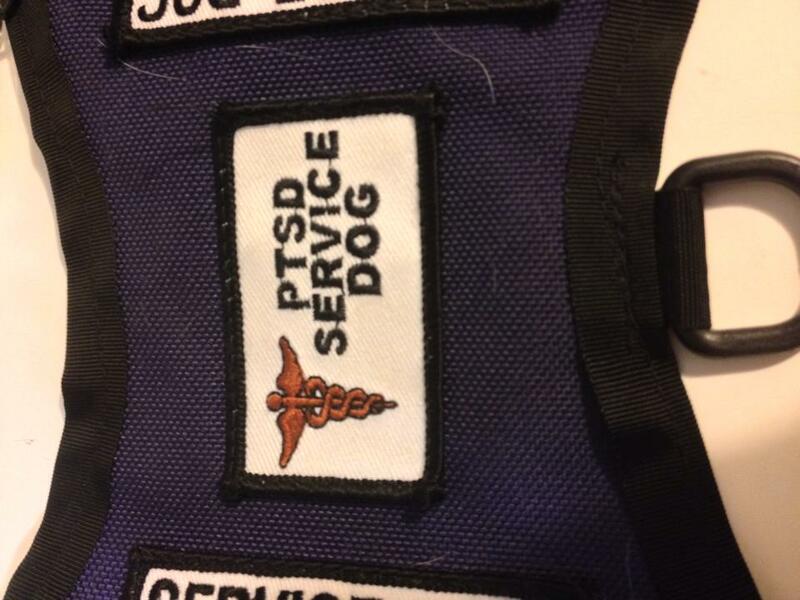 Patches are used to identify what the dog is used for and usually “Service Dog” or “Guide Dog” will do but I chose to be more specific as I get tired of explaining what “type” of Service Dog Toki is. I think when people see PTSD, they don’t really want to ask further questions and I am comfortable with people knowing. 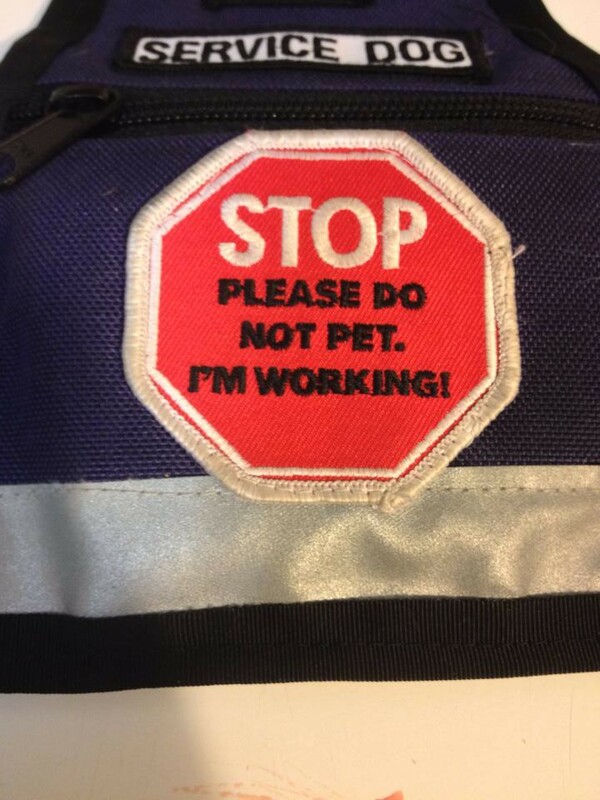 A common patch to see is the “DO NOT PET”, which is usually in the shape of a stop sign. The patch may also indicate not to stare, talk to or distract the dog as they are working. Toki is not easily distracted so the no petting patch was good enough for us. I notice that even though this patch is large and red; some people do not see or completely ignore it. I have heard parents teach their kids about the stop sign patch and how it means to not pet my dog because it is working. I wish all people were educated on this and paid more attention to the vest than my cute dog. The stop sign does work in most cases and it does help identify that Toki is a working dog. There are many options for service vests and what the handler decides to put on it is really up to them. Toki has her name embroidered on hers, a pin and some charms. Reflective tape helps in dark lighting for visibility. There are also two pockets sewn into her vest to carry her paperwork and other important things. Buckles hold up a lot better than Velcro and I know this from experience with Toki’s last vest. Heavy water resistant fabrics are better than light weight fabrics like cotton which absorb sweat, get smelly and dirty easily. A service vest helps a dog doing a job and their handler too. It provides identification and allows the public to know the dog is working. As a handler you can chose any vest you wish and the options are really up to you. However, a vest does not mean a dog is a qualified Service Dog and paperwork from the handlers treating physician or forms from an accredited organization are needed*. Buying and putting a service vest on any dog is a crime and it also makes people with trained Service Dogs have a harder time in public. Remember a service vest is only for a working dog and not to let your non-working dog in a store with you. Service Dogs have years of training and are medical devices for their handler. 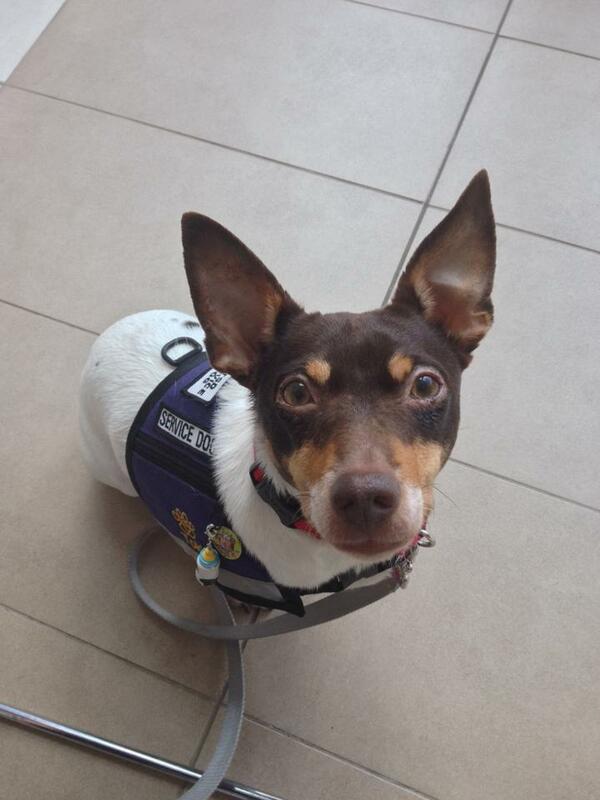 Travelling in a wheelchair when you do not need one is the same as posing a non-Service Dog in a working vest. *Check your local laws for what is needed for accessibility. I would love to see more examples of other vests used by Service Dogs because there are so many options! 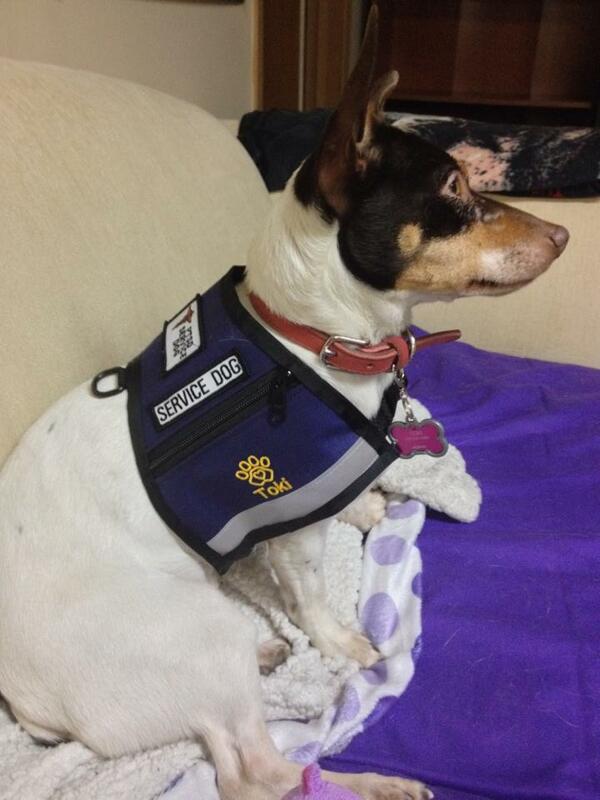 A Service Vest Helps Identify a Working Dog. Last weekend was our first large convention together and we had a great time. 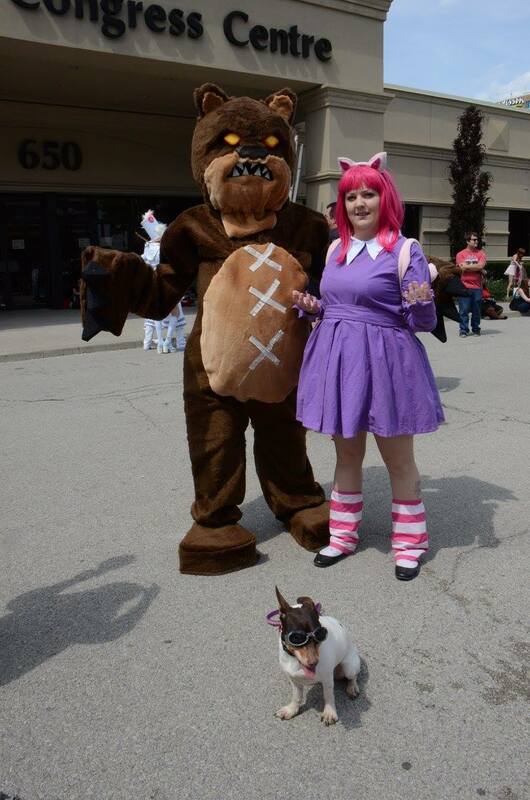 Toki and I have been to smaller conventions but Anime North is a much larger convention. Anime North is an anime convention held in Toronto,Ontario (Canada) and is held once every year in May. The demographic is a younger audience and is always a fun event filled with lots to do and see. I decided that this convention Toki would be on ‘semi-duty’; meaning I allow people to pet her and she would only have her vest on when inside the convention center. The majority of the convention is outside and everyone hangs out together so I thought it would be good exposure for myself and for her too. I even managed to make her a few costumes for the event so we could both enjoy the fun together as I cosplay at many conventions. I have broken up our adventure into sections just because so much happened that weekend and I want to share it all! This convention also meant staying in a hotel for a weekend. The hotel we stayed at was very accommodating and even allowed Toki to be without her vest when we walked her for bathroom breaks. 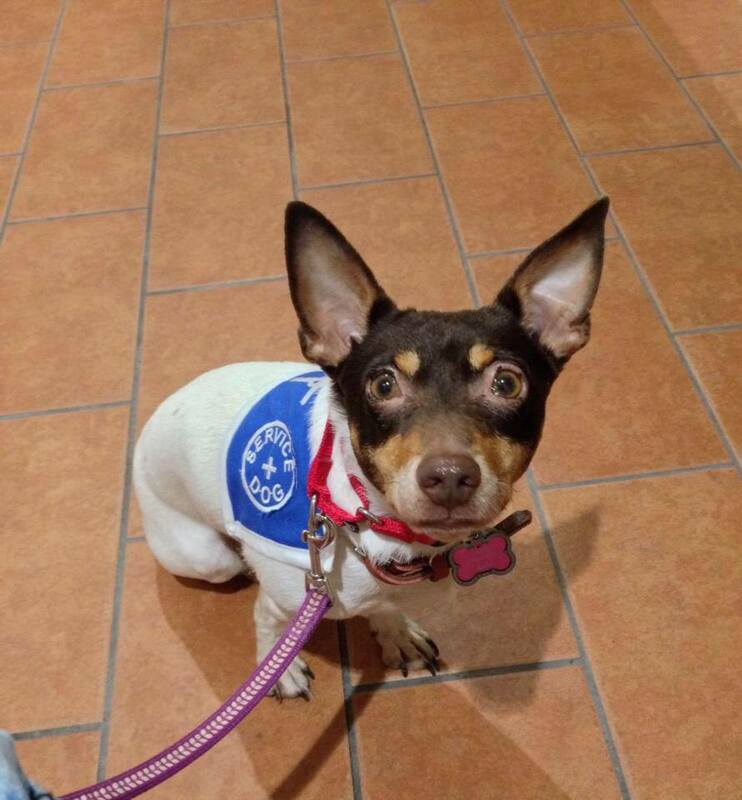 I had to fill out some paper work and have them photo copy my notes so they knew she was a Service Dog and could be allowed access to the hotel. They even explained she could come to the pool area when I asked about it. I was so nervous I would have to explain myself to them and make a scene in front of people. It was nice to not have to feel anxious and stressed out about the experience. Toki loved the hotel room too and we had a great time with friends staying in the hotel room with us. It was a nice experience and Toki was very well behaved by the pool while friends and I swam and had a great time. Toki had a great time and even had her photo taken numerous times at the convention. 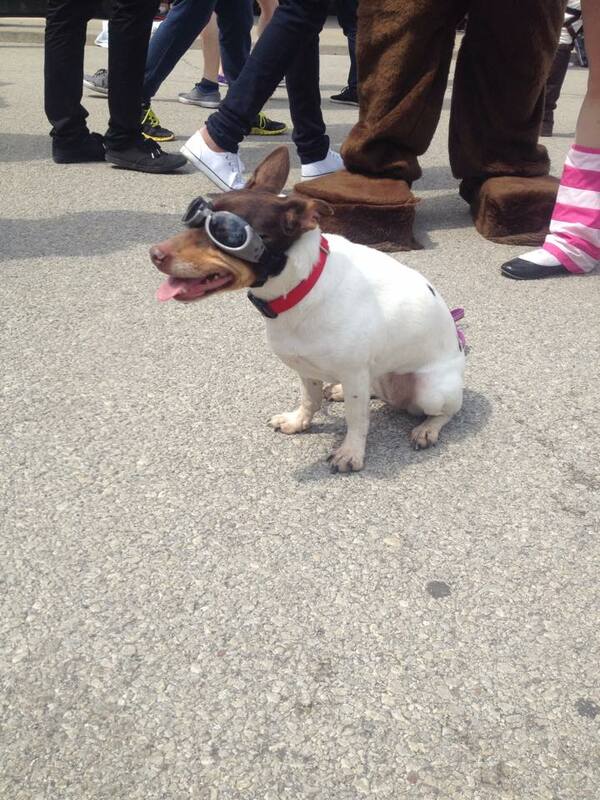 People seemed to really enjoy seeing a dog in cosplay at the convention. I took the opportunity to explain that Toki is my Service Dog and what she does for me. It was nice having people truly interested in her work and not judgmental at all. I even managed to help some people who were interested in Service Dogs for their own mental health as Toki is a PTSD Service Dog. It felt really great knowing I was respected and so was Toki. I only had a few incidences where people pet Toki without permission and she had her vest on but I was very calm and explained that they needed to ask as she is a working dog. It was an amazing experience and I am happy I took the time to educate people on Service Dogs. Next year I am hoping to have business cards made for my blog because I had so many people interested! It was very hard to maneuver the Dealer’s Room as it was very busy and crowded. The main issue was that Toki is a small dog and no one bothers to really look at the floor when they are walking and shopping. It got so bad with people kicking or stepping on her that I had to have my fiance pick her up. I found it very hard to stay in there very long as my anxiety was very bad because of the situation. I could only imagine how hard it was for people in wheelchairs or with other mobility devices. I think that is one thing that conventions seem to not be very fun for and I wish they could make accessibility easier for for people who need the assistance. I was thankful to have my fiance carry Toki but I felt bad for people who did not have a choice. I think people just need to be more aware of their surroundings. I did manage to find a few things to buy; including some new Toki Doki charms for Toki’s vest and a Toki Doki button as well. So the stress and anxiety was worth it in the end I suppose. The weather this year turned out to be sweltering on the Saturday and Sunday and this meant lots of breaks for water and shade. Toki was in her sunglasses and doggy sunscreen and we made sure to hydrate her as much as possible. This is one thing I can not stress enough to people with dogs. Dogs can get heat stroke and become dehydrated just like humans can. They are also able to get sunburns too and they need to be protected. 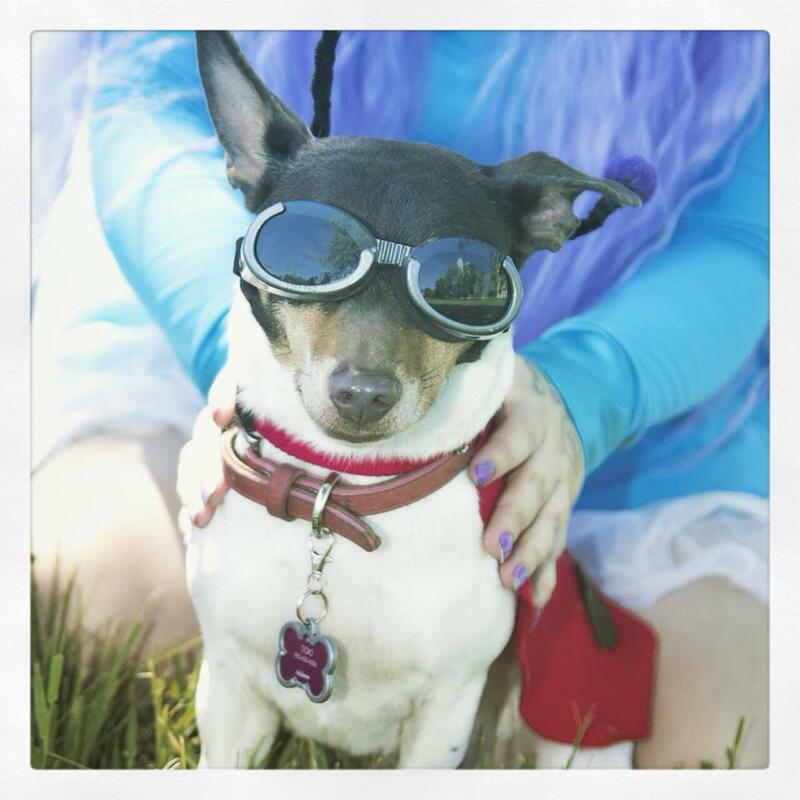 Look into doggy sunscreens and also purchase a pair of Doggles for your puppy. The Doggles are not only functional and great for protecting your dogs eyes but they are also a fashion statement too. Toki had so many people in love with her sunglasses and I made sure to explain that they are needed, especially because she does not have eyelashes or fur around her eyes due to a skin infection when she was young. So remember to keep your dog whether a Service Dog or not, out of the sun or provide them with the protection they need. 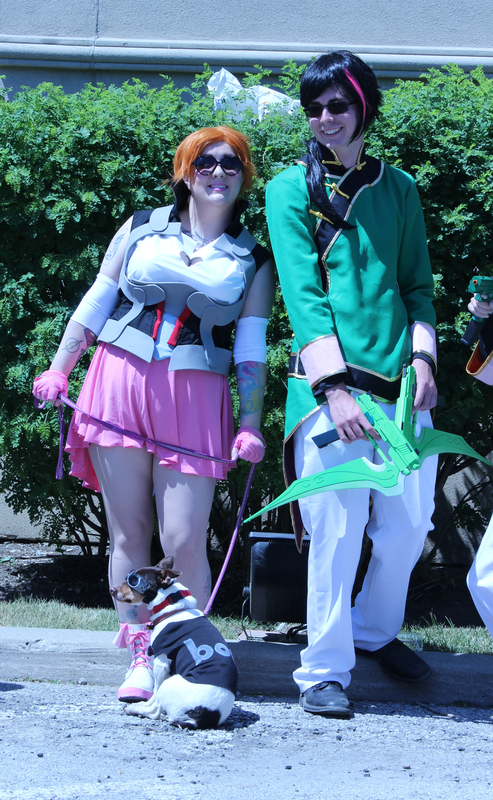 I always am sure to keep a bottle of water for my dog with me and it really helped Toki at Anime North with the heat wave that we all experienced. Here are some photos of Toki’s costumes which I made myself and went along with the costumes I was wearing for the day. The crowds of people seemed to adore the costumes on her and she seemed to like the attention and wearing them. It also gave allowed me to talk to people about her and her job. I love educating people on my Service Dog! I cosplayed Fionna from Adventure Time so Toki was LSP! I went as Nora from RWBY so I made Toki a shirt that said “Boop” from the show. 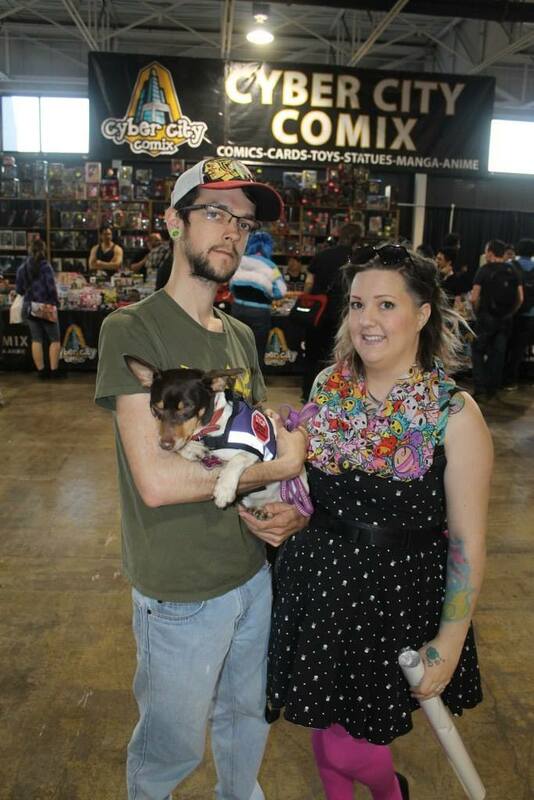 We both had a great convention and we can not wait until next year to do Anime North again. The next convention we will be attending is this weekend at Niagara Falls Comic Con! Service Dogs are not always at work and can enjoy some play time too!